Follow the Reaper is the 3rd album by Finnish metal quintet Child of Bodom. It shows the band stepping away from the black metal tinged sound of Something Wild and Hatebreeder to focus on traditional heavy metal offshoot speed metal and the well-established subgenre of power metal. Vocalist and lead guitarist Alexi Laiho manages to retain his high pitched screech that makes him sound like an aggravated troll that just found out that someone has walked over his bridge. He is still impossible to understand even if the lyrics are written out in front of you. This makes you wonder if the lyrics where written just for the sake of having a vocalist as Follow the Reaper would have made for a fantastic instrumental album otherwise. This won’t be of any detriment to their fans but it will certainly ward off many other potential listeners. The drums, bass and second guitar all find themselves in strict rhythm roles on Follow the Reaper and while the drums and guitar are easy to hear, the bass is reduced to background noise unless the listener pays close attention to it. 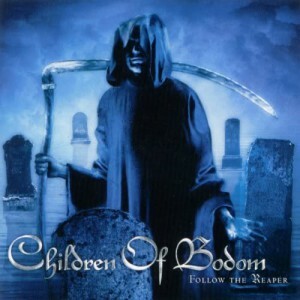 Children of Bodom haven’t gone through a metamorphosis in their decision to move away from their black metal influence but it is still easy to hear where their well-earned reputation stems from on Follow the Reaper. The most impressive aspects the album are the premier song-writing abilities of Alexi Laiho and the interaction between himself and keyboard player Janne Wirman. These elements are what make Follow the Reaper a staple of the Children of Bodom discography and a highlight of the metal scene upon its release.